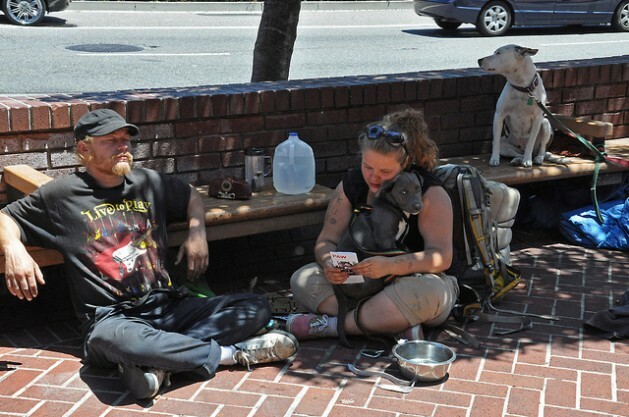 BERKELEY, California, Jul 13 2012 (IPS) - Amber, 24, who’s been living on the streets half her life, was sitting on a sunny sidewalk in downtown Berkeley last week, cuddling her three-month-old puppy and talking to a friend. But if voters approve a measure the city council placed on the November ballot, sitting on the sidewalk – after a warning – could cost her 75 dollars. “That law will give us tickets we can’t pay, then we’ll have warrants and end up in jail,” said Amber, who “spanges” – asks for spare change – to feed herself and her unborn child. Although the council chambers was packed with those opposing the law, the city council, at the end of a dramatic meeting that went past midnight on Jul. 11, approved putting the sit ban to a vote. The proposed ordinance is similar to statutes in Seattle, Washington, Anchorage, Alaska and Santa Cruz, San Francisco and Palo Alto, California. It would ban sitting on the sidewalk in commercial areas between seven a.m. and 10 p.m. Some four dozen public speakers addressed the council, many arguing that the economic downturn is to blame for Berkeley’s vacant storefronts, and that punishing the homeless won’t bring back business. John DeClercq, Berkeley Chamber of Commerce CEO, the sole speaker favouring the measure, said the law would make the city’s business districts “more welcoming”. The three councilmembers opposing the sit ban joined the sing-along, as the five other councilmembers present left the room. When they returned, in the midst of chaos, the majority voted to place the measure on the ballot. The dissident councilmembers contend the vote was taken without council debate and therefore illegal. “They can’t stand a people’s democracy,” said Councilmember Max Anderson. Hundreds of cities around the United States have laws advocates say unfairly target the homeless, including bans on sitting, lying, begging and placing objects on the sidewalk. Other laws, such as prohibitions to loitering, drinking alcohol in public, smoking and jaywalking, are applied to this population selectively, homeless advocates say. In other news from Berkeley, California, police chiefs from the University of California, Berkeley, the city of Berkeley and the adjacent city of Albany announced on Jul. 5 – after an outcry from citizens in both cities and student government leaders – that they would not accept the grant from Homeland Security for the armored personnel carrier for which they had applied without alerting local elected officials. Two years ago, San Francisco banned sitting on all city sidewalks. But the law hasn’t stopped the practice. IPS visited San Francisco’s Haight-Ashbury commercial district and counted nine individuals seated on sidewalks. Michael Anthony Billingsly, 21, was sitting on Haight Street with a friend, singing for spare change. People came by and dropped dollar bills into his paper cup; some tourists waved from a passing bright red two-decker bus. Billingsly was hoping police wouldn’t cite him – again – for sitting on the sidewalk. “The cops should give me a guitar strap and I’ll stand up,” he joked. Paul Boden, of the San Francisco-based Western Regional Advocacy Project, likened “quality of life” laws that target the homeless to racist “Jim Crow”, “unsightly beggar”, and sundown town laws intended to exclude poor and non-white people. “All these laws also used use low-level infraction or misdemeanor offences so that the police had the authority to get you out of town,” Boden said. Business interests appear to drive passage of such laws. Homeless advocates, however, predict that compliance will be handled through police, courts and jails. Sally Hindman, director of Youth Spirit Artworks, a daytime programme that engages homeless and “couch-surfing” youth with art, says the Berkeley ballot measure targets homeless youth. She scoffs at the notion that there are adequate services for people age 16-25. The city’s sole youth shelter sleeps 25 of the estimated 225 young people on Berkeley streets every night and is open just half the year. The city has no daytime centre for youth and lacks lockers to store belongings. There are some supportive housing opportunities, but no “wet” housing for young people who use drugs and alcohol, Hindman said, underscoring that it is insufficient for an ambassador to simply tell homeless youth where to find a programme. Hindman often hears people say that young people on the street are out for a lark. “There are a variety of factors beneath the nice smiley faces; there are enormous experiences of trauma and abuse,” she said. Twenty percent of youth on the street are GLBTQ (gay, lesbian, bisexual, transgender, questioning), displaced because of persecution in their homes or home towns, she said. Thirty percent of the street youths experienced first episodes of mental illness, and left home “because their environments are not able to understand that what they were exhibiting were signs of the onset of mental illness,” Hindman said. Osha Neumann, an attorney who defends disenfranchised youth, said most youth won’t pay citations for sitting. Many have no address to receive court date notices and to get to court without public transportation fare is difficult, he said. When people don’t show up, they get cited for failure to appear, a warrant is issued and they can be arrested. Once someone has a criminal record, it’s harder to get housing and employment. “Criminalisation will only drive them away from services, and more deeply alienate them,” Neumann said. Neumann fears commercial real estate interests will heavily finance the campaign to enact the sit ban. “People sitting on the street don’t have that kind of money,” he said. Adonis Pollard, 19, became homeless at 15. Today, he’s housed and works as an artist-trainee at Youth Spirit Art.